"Lessons of the Hour -- Frederick Douglass"
Wednesday through Sunday, 11 a.m. to 5 p.m.; Thursdays & select Fridays until 9 p.m. Though the written words of escaped slave, Abolitionist, orator, and statesman Frederick Douglass continue to resonate into the present, and though he was photographed more than any other American of his time, he now exists within our collective imagination. And with time, he becomes more and more like a mythological figure. But a new film installation currently on view at the Memorial Art Gallery presents Douglass as a living, breathing man in various public and private moments of his life. 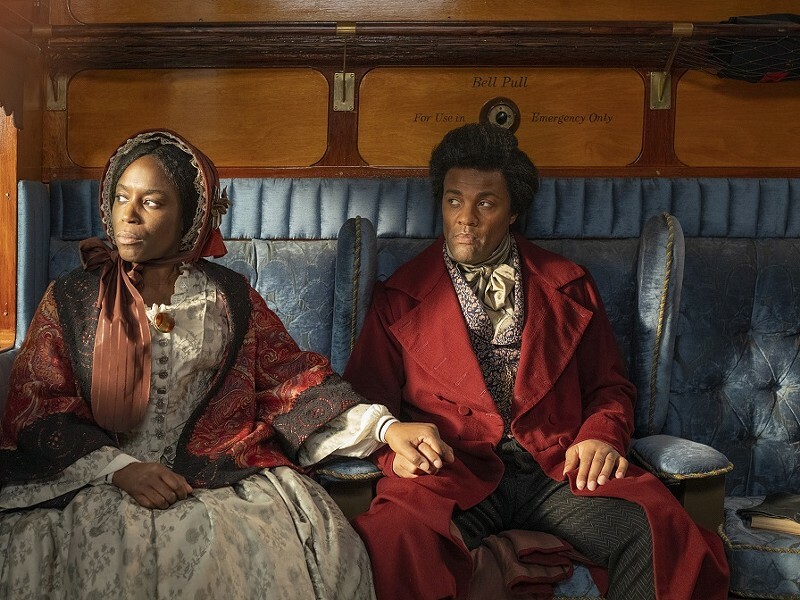 Filmmaker Isaac Julien's newest installation, "Lessons of the Hour -- Frederick Douglass," is the second commission by the MAG for its Rochester-focused "Reflections on Place" series, curated by John G. Hanhardt, and this exhibition is the world premiere of the piece. Julien's work is non-linear cinema, unfolding in episodes as an A/V collage across 10 large and small screens. Yet each richly-constructed scene reads as an immersive film, bringing Douglass to life. The vignettes bring viewers into the rooms where he gave renowned speeches, into quiet moments alone with his pen, and into the present political times when his -- and our -- work remains unfinished. "The work is about looking at Frederick Douglass through the present to the past and then back again," Hanhardt says. For this presentation, the MAG's Docent Gallery is entirely transformed into a many-sectioned viewing room, each space painted black and with sparse, carefully positioned lighting. An outer chamber holds a crescent of large tintype photos of three of the actors from the film, and the innermost chamber has a row of cushioned seats facing the arc of screens. The space's deep crimson carpet matches one of the bright coats worn by Douglass (played in the film by Ray Fearon) and picks up on colors in each lush scene. "Lessons of the Hour" was filmed in both 35mm and digital technology, and shot on location in Baltimore -- some scenes were shot inside Douglass's home -- and in Scotland, where Douglass traveled to lecture and meet with Quaker Abolitionists. Julien worked with a large team of artists to produce the work; beyond the cast of actors, he credits multiple exhibition designers and a crew that rivals any short-length feature in scale. Douglass recognized that photography could be used as a powerful tool to represent the self to the masses. Julien's work is an extension of this; it envisions and attempts to recreate the power of his presence. And hammering that point home: in one scene Fearon gives Douglass's "Lecture on Pictures," while on other screens he and various actors sit to be photographed. A good portion of the work emphasizes the fullness of solitude. Any peace found in those moments is heavy with both memories of lived experience and the burden of work yet to be done. In some scenes Douglass sits alone composing letters and speeches, or he roams in the woods. The contemplative serenity of that autumnal scene is disrupted by cracks of a whip, and by visions of a lynching. 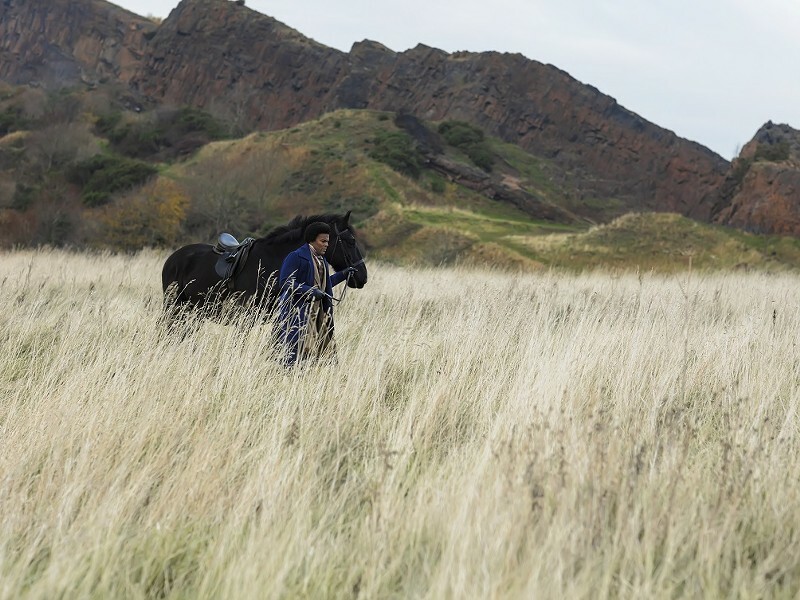 In another scene he leads a horse through the Scottish landscape, and each different screen focuses on Douglass's blue-coated figure. He's dwarfed by great sweeping views of the land he travels. There's minute details as well: the camera follows the horse's hooves in tall grass, and on other screens it focuses on his face taking in the gentle melancholy of the sights. All the while, a dramatic composition of stringed instruments floods the room. The romanticism of this scene peaks when a larger screen focuses on Douglass, having crested a cluster of rocks, turned away from the viewer and staring off into the distance ahead of him. It's an unmistakable allusion to German Romantic painter Caspar David Friedrich's "Wanderer above the Sea of Fog," from his stance to his overcoat and walking stick. Douglass often travels by train in this work, and in one episode the steel wheels spin in time with the rotating mechanisms of the sewing machine where Anna Murray Douglass, on another screen, is at work constructing her husband's clothing. She looks up and stares into space, matching his meditative expression. In one of the most complex scenes, the installation combines overlapping images and sounds that leap back and forth through history. Some screens show views of Douglass addressing a mixed contemporary and historic crowd with his "Fourth of July" speech. On other screens, aerial footage sweeps over Baltimore at night, showing modern-day views of the city which pointedly include the Domino Sugar refinery and a Transamerica Corporation high-rise. "These shouts of liberty and equality: hollow mockery," Fearon-as-Douglass booms over images of slave ships sailing on dark waters. And subtly, on a small side screen, proud fireworks shrink as they explode in reverse. Also appearing on some screens during this speech scene is drone footage from the Baltimore Police Department, tracking the movements of people during the 2015 Uprising after Freddie Gray was killed. The vibrant colors and rapt attention of the audience as it watches Douglass speak contrast sharply with the infrared, robotic views of the drone coldly surveilling, but far removed from the community's despair and resistance.